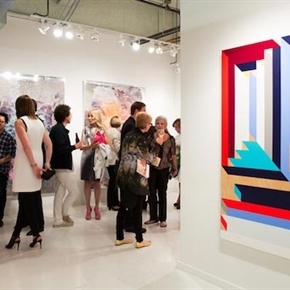 The ninth annual Dallas Art Fair takes place this April at its usual venue, the Fashion Industry Gallery (FIG) building downtown, and has announced a list of 2017 exhibitors. The fair has managed to lure a slew of first-time (and some big-name) international exhibitors this year, including Gagosian, Lehmann Maupin (New York/Hong Kong), and Simon Lee Gallery (New York). At this point there are reportedly at least 90 galleries on board, with, as the DAF points out, a 70% return rate, galleries from 16 countries, and 30 new exhibitors this year. Texas galleries in the fair this year include AND NOW (Dallas), Barry Whistler (Dallas), Conduit (Dallas), Cris Worley (Dallas), Erin Cluley (Dallas), PDNB (Dallas), Ro2 Art (Dallas), Talley Dunn (Dallas), Valley House (Dallas), and William Campbell (Fort Worth). So, all DFW. The Fair takes place from April 6 through April 9.